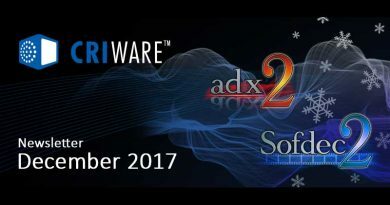 The monthly CRIWARE newsletter brings you news about ADX2, Sofdec2 and other amazing audio and video technologies from CRI Middleware. Not a CRIWARE user yet? Register now to get your free evaluation version and discover how CRIWARE can help you boost your productivity and unleash your creativity. In this issue: an incredible Unity Pro / ADX2 offer, optimizing your memory footprint in AtomCraft, introducing the new Aeropoint GUI and a look at the sample calculator! During the Black Friday / Cyber Monday period, Unity is offering a generous discount on their Unity Pro subscriptions. The best part? It includes the ADX2 plug-in for free! The offer is still valid for a couple of days so don’t waste a minute! Jump to the Unity web site so that you can get a Pro license cheaper and experience ADX2, the perfect audio middleware for your Unity games, for free! 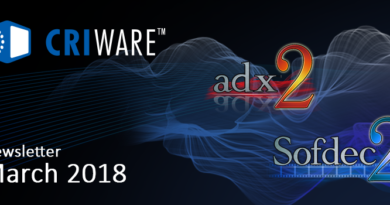 Each month, the CRIWARE Blog publishes industry news and event reports, interviews of game developers as well as in-depth articles on game audio implementation with ADX2. In November, we explain how to minimize your audio memory footprint in AtomCraft by organizing your sounds in banks and choosing the right encoding settings both at the macro and micro levels. To learn how you can shave those extra kilobytes in time for the holidays, check this new blog post! This month, let’s give a look at a small but very useful function of AtomCraft, the SampleNum Calculator. Available from the Tool menu of AtomCraft, the SampleNum Calculator gives you the length in samples – or the duration in milliseconds – corresponding to the number of beats you specify, given a tempo in BPM and a sample rate in Hz. The SampleNum calculator is useful for example when you want to import Materials that have the right duration to be used as blocks for interactive music. “Aeropoint® GUI”, our new GUI middleware is another example of the diverse projects keeping our engineers busy at CRI HQ. With Aeropoint GUI, it becomes easy to create beautiful and expressive user interfaces for smartphones and other embedded devices that typically require specialized technology and high development costs. High-quality, sophisticated GUIs with moving elements can now easily be implemented on devices with lower graphics capabilities such as home appliances and industrial equipment in order to improve the visibility of the information and the user experience. For more information about it, check this blog post or contact us! 【海外ニュースレター配信：2018年２月】 CRIWARE News: meet us at GDC 2018, learn more about G.A.N.G., the session window in AtomCraft.